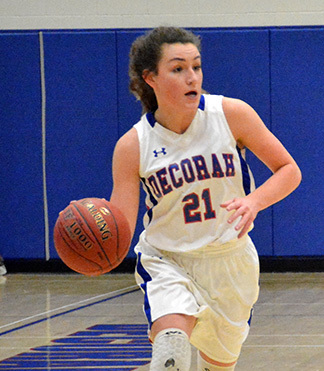 With the regular season wrapping up the Decorah girls’ basketball team (4-17, 3-9 NEIC) picked up a conference road win Friday night, defeating Charles City (0-19, 0-12 NEIC), 51-49, on the road. The Vikings were strong from the opening tipoff. After falling behind 2-0 early, the Vikes kept Charles City from finding the basket while going on a 15-2 run to finish off the final five minutes of the first quarter. Decorah kept it’s the foot on the gas in the second quarter to claim a 24-6 halftime lead. The tides turned in the second half as the Comet offense came alive and chipped into the Decorah lead to make it 39-26, in favor of the Vikings with eight minutes of play remaining. Charles City continued to throw the offensive blows in the final quarter, pulling to within three, 48-45, with a minute remaining. However, Decorah managed to hang on for the win. The hot hands went to Abigail Milburn and Emma Nierengarten with both in double figures. Milburn knocked down 16 points and had five steals, while Nierengarten connected for 14 points and pulled down eight rebounds. Dishing out a team-high four assists was Ambria Pipho. Next, the Lady Vikes will compete in the Class 4A Region 3 playoffs Wednesday, Feb. 13, when they travel to Independence. The game will tip-off at 7 p.m. in the Mustangs’ home gymnasium. The winner moves on to face Mason City Saturday, Feb. 16, at 7 p.m. in Mason City. The regional final is Tuesday, Feb. 19, at 7 p.m. at the highest remaining seed.